Gordon Laird reported from Los Angeles for The Price of a Bargain: The Quest for Cheap and the Death of Globalization . He found the city’s most crucial economic input to be not movie stars or tourists, but shipping containers. “The profound way that Los Angeles has wagered upon the continued health of globalization – and has done so using some pretty ingenious strategies and has spent no small amount of money on it – really does make it a city of the future,” Laird said. “But I”m not sure if this future will be good for Southern California.” Below, an excerpt from Laird’s writing on Los Angeles. The fate of Los Angeles is a global story. And while oil deposits financed the development of Los Angeles Basin – and many large public works projects that ensured the city’s future growth into one of the world’s great global cities – it tied its fate to shipping and shopping. It now manages the ups and downs of globalization, pollution impacts, economic health, and countless other varied and competing interests. Goods movement has been a windfall, like the oil rush and Cold War military manufacturing that preceded it, yet economic cycles aren’t what they used to be; they are now fraught with new variables, challenges, and constraints. In many ways we played globalization like an oil or gold boom, extracting as much as possible as quickly as possible, and staging areas like Southern California and South China were transformed in the process. In a Terminator-style twist, California has returned to the past to help save the future. Late in 2008, it was revealed that the old Wilmington oil field beneath the harbor could still hold $1 billion in revenue by 2018. 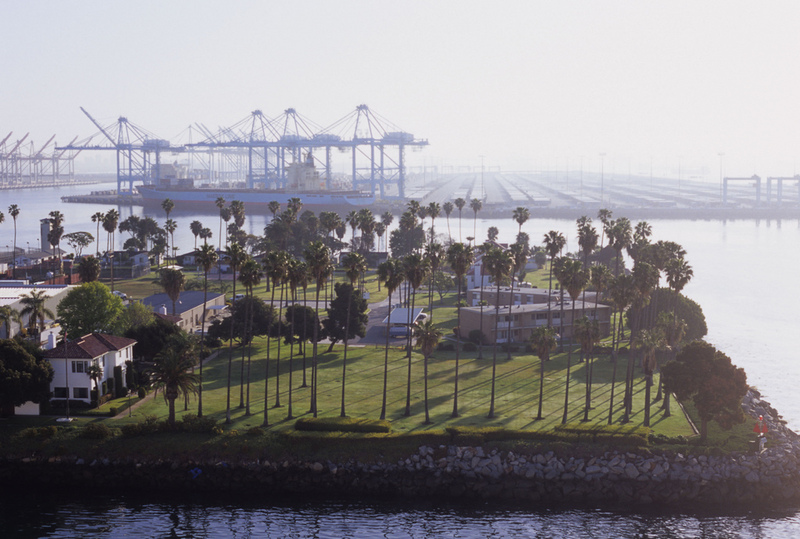 It’s an unexpected cash windfall for cities like Los Angeles and Long Beach, who have begun to strain under growth and cost pressures at their respective ports, as well as California state and Occidental Petroleum, who would deploy new injection technology to squeeze hidden hydrocarbons out of the recesses of the muddy harbor. The Wilmington field has 4,000 different wells; new technology could squeeze a 63 percent increase in oil output out of the last remaining producers, plus add several new wells. Long Beach mayor Bob Foster touted the plan to protract the life of an aging oil field as a “win-win for everyone.” The ports themselves could gain $150 million alone, and some valued relief from their current entrapment within billions of new environment-related expenses, increased operating costs, and continued threat of decreased growth in container traffic. Oil money could offer some latitude to address the environment-community gridlock that threatens the ports. Yet new exploration and new drilling opens up the specter of longstanding contamination and health impacts, not just the barrens of Signal Hill, but also of more recent fiascos, such as the 1969 oil spill from a platform in Santa Monica Bay which leaked 200,000 gallons of crude into an 800 mile oil slick that covered local beaches. On the other hand, with predictions of a growing flotilla of large oil tankers arriving in San Pedro Bay, adding more congestion, pollution, and risk of spill, homegrown crude does have some advantages. In September 2008, U.S. Congressional Democrats reversed a decades-old policy against offshore drilling, potentially opening up vast stretches of ocean from Florida to California. (Not unrelated, oil companies contributed $90 million to California political campaigns in 2006.) On shore, depleted oil fields across the Los Angeles Basin are being drilled again, from Beverley Hills to the harbor and beyond. In 2008, several new wells were sunk into the depths of Signal Hill. One exploration company estimated that Signal Hill itself has two billion more barrels of recoverable oil hidden deep beneath the shallow formations previously claimed by drillers in the 1920s. Unlike Sinclair’s 1920s microcosm of frontier industry, today’s players in Wilmington and Long Beach are also the world’s largest corporations, representing the vanguard of the global economy: Wal-Mart, Chevron, ConocoPhillips. Los Angeles launched the modern oil industry, pioneered automobile culture and urban sprawl, and helped deliver the world into container ship consumerism. And on many fronts, it is attempting to reinvent past growth patterns – drilling deeper, shipping faster – as future challenges bear down, based on an irrepressible optimism about the limits of our material world. Sinclair made Signal Hill famous, yet his tales of desperation, corruption, and conflict seem nearly quaint in hindsight. Sadly, in our time, squandered fortunes, depleted economies, and polluted zones are no longer limited to a dusty little 2.5 square mile patch of land. Excerpted from The Price of a Bargain by Gordon Laird. Copyright © 2009 by the author and reprinted by permission of Palgrave Macmillan, a division of Macmillan Publishers Limited. All rights reserved.